Assam Power Generation Corporation Limited (APGCL) invites applications from citizens of India having requisite qualification for filling up following vacancies under Assam Power Generation Corporation Limited. 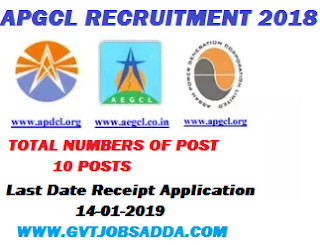 Those candidates who are interested & eligible for this vacancies candidates should visit official website of APGCL and apply before last date of apply online. Brief information has given below. Rs. 500.00 (Rupees five hundred) only in case of General/OBC & MOBC category of candidates and in case Scheduled Caste and Scheduled Tribe category of candidates Rs. 250.00 (Rupees two fifty) only payable by Demand Draft to be pledged in favour of Deputy General Manager (F&A), APGCL,3rd Floor, Bijulee Bhawan, Paltanbazar, Guwahati- 781001. If any candidate does not pay or pay less than amount prescribed, his candidatures will automatically be cancelled. Applications in the prescribed format available in APGCL’s website www.apgcl.orgduly completed and signed, along with certified photocopies of all relevant documents in support of age, educational qualifications, proof of Domicile etc. are to be sent to General Manager (HR), APGCL, 3rd Floor, Bijulee Bhawan, Paltan Bazar, Guwahati-781001 on or before 14/01/2019. Bachelor’s degree in Science with Honours/ Major in Chemistry with minimum 50% marks in Honours/ Major subject from any University recognised by the Govt. of Assam/University Grants Commission. Proficiency in computer having 6 months Diploma/Certificate in Computer Application from Govt. Institute or Govt. of Assam recognised Institute. For Group A Category: Not less than 21 years (Twenty One) & not more than 44 years (Forty Four) as on 31/10/2018. For Group B Category: Not less than 18 years (Eighteen) & not more than 44 years (Forty Four) as on 31/10/2018. Selection Procedure Of APGCL Recruitment 2018 : Candidates fulfilling in the above criteria will be eligible for appearing written test/viva-voce/Interview to be notified in due course.